The AGROVOC thesaurus was first published (in English, Spanish and French) at the beginning of the 1980s by the Food and Agriculture Organization (FAO) of the United Nations. In 2000, AGROVOC abandoned paper printing and went digital, with data storage handled by a relational database. In 2009 AGROVOC became an SKOS resource. Today, AGROVOC is available as an SKOS-XL concept scheme, also published as a Linked Data (LD) set composed of 36,000+ concepts available in up to 33 languages. By means of LD, AGROVOC is aligned to 18 open datasets related to agriculture (see: AGROVOC LD). The advantage of having a thesaurus like AGROVOC published as LD is that once thesauri are linked, the resources they index are linked as well. 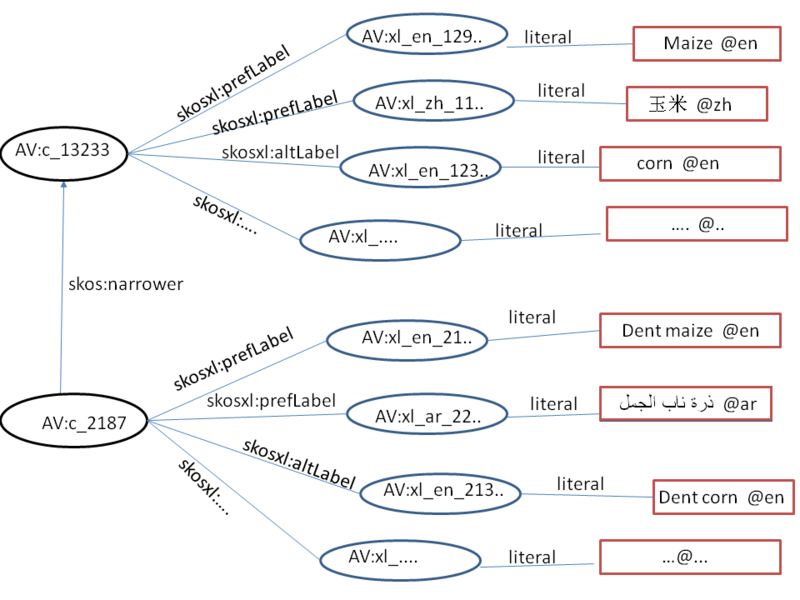 AGROVOC is widely used in specialized libraries as well as digital libraries and repositories to index content and for the purpose of text mining. It is also used as a specialized tagging resource for knowledge and content organization by FAO and other third-party stakeholders. Concepts, their labels and relations are the basic notions for an RDF / SKOS-XL concept scheme like AGROVOC. Concepts are anything we want to represent or “talk about” in our domain. Concepts are represented by terms. A concept could also be considered the set of all terms used to express it in various languages. In SKOS concepts are formalized as skos:Concept, identified by dereferenceable URIs (= URL). For example, URI http://aims.fao.org/aos/agrovoc/c_12332 is the AGROVOC concept for maize. Terms are the actual terms used to name a concept. For example maize, maïs, 玉米, ข้าวโพด are all labels for the same concept in English, French, Chinese and Thai respectively. skosxl:altLabel, used for non- preferred terms. In SKOS, hierarchical relations between concepts are expressed by the predicates skos:broader and skos:narrower. They correspond to the classical thesaurus relations broader/narrower (BT/NT). The figure below represents a fragment of the AGROVOC concept scheme. Circles are used to represent objects with URIs, boxes are used for literal values and AV, SKOS and SKOS-XL are short for http://aims.fao.org/agrovoc, http://www.w3c.org/2008/05/skos-xl#, http://www.w3c.org/2004/02/skos/core# respectively. The figure shows two AGROVOC concepts linked by the property skos:broader (hierarchical relation), each with an SKOS-XL label.